Mr. Emmet Feerick died in 1989 at the great age of 91 years RIP. He was to be called Thomas Emmet but because of the 100th anniversary (1898) he was called Emmet after the famous leader Robert Emmet according to his son John, who still lives in Ballinrobe. I find the days of my boyhood again: those old days when I toddled along the streets of my native town. If I could see the old market again, or meet some of the old characters I knew, I would give a great deal. In Glebe Street, John Gill, the last of the nail makers, had his forge. The window was too high for me to look through, and often, an older schoolboy would hoist me up in his arms, to gaze in through the window, at the mystery of the nail-making. John presided over the fire and anvil, clad in his hard hat and leather apron. Small boys were forbidden to go in there, but when I grew older, and perhaps bolder, and was no longer afraid of the flying sparks, I got to know the kindly John. He stood there day after day, making boot nails, slating nails, and every kind of nail, hammering away, chewing his "quid" of tobacco, and all the time deftly turning out the nails. He was always a mystery to me. By day it was a busy forge; by night it was a meeting place, especially for his friends of "the Glebe" and all the important events of the day came under the hammer. He liked "the bit of company" he would say to them as he bade them "good night". Sometimes when I am coming down Glebe Street I think of him, and of all the others I used to know there. I remember Maura Lynagh marching down the Glebe with a "skib" of oranges balanced on her head, and a "skib" of nuts under her right arm. She hurried along to the steps of the Market House, where she settled herself, and placed her wares on a stand of her own design. There, she arranged her plentiful flowered skirts, and prepared for business. Come Halloween, she had to compete with rival stalls, but she remained our favourite. She gave the glass of nuts for a halfpenny - pennies at that time were scarce and the halfpennies counted. In the Italian warehouse up the street, pears, for instance, cost four-pence each, but when the local pears came in, we got a pocketful each from Maura. It was no wonder she remained a firm favourite. It was sheer cupboard love. For only a "make" we could taste the most delightful concoctions of Tom Lunn, the sweet-maker in Glebe Street. My mouth still waters when I think of the sweets, and especially the ‘Peggy's Leg’ hanging on the door peg, plaited like a girl's hair. Tom and Anne, his helpmate, used to make it; but they have both passed on for many years. 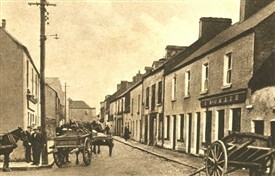 Ballinrobe in those days was a more colourful place and of all days, the market day was probably the liveliest. Glebe Street was lined with carts of turf down to the Bank corner. The turf was neatly built up on the horse carts, rather in the shape of a pyramid and this pyramid was rounded off on the top with a bag full of fresh hay for the tired horse, who stood there patiently, and who ate it greedily from the hands of his master, after he had sold his cart of turf. Agricultural produce was in great demand then, because many houses in town owned a horse and a cow. This produce was sold in Abbey Street. Two weighing machines were used for weighing stacks of potatoes. There was a huge scale for hay and straw there too. Buyers duly arrived and judged hay by the feel of their hands and the sight of their eyes. Bargains were struck; the hay was weighed; and the money changed hands. Potatoes cost three-halfpence a stone then, and sale was good. The ciseán [basket] of eggs had a strange way of being valued. If the price of a hundred eggs did not equal the price of a hundred of oats, then the hens weren't paying their way, and it was alleged that every hen that died in Ireland died in debt. When the housewife sold her eggs, she walked along the fish carts to select the best. The extra herring thrown in for the ‘cat’ was always welcome—the long hundred of course was the gauge. 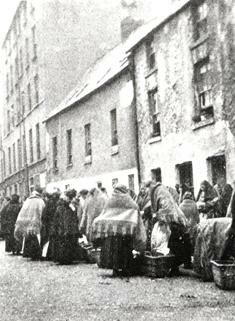 The fish-carts landed early in the Market Place, having travelled all night from the Galway docks. In Main Street, the rolls of homespun flannel were sold along the rectory wall. 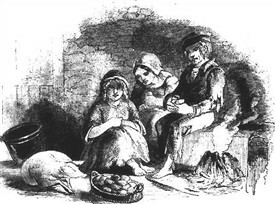 Down near Maura's stand at the Market House, the "Jack Chapes" or "Shlap of the Hands" had their stalls. They sold a great variety of things - all types of second-hand clothes, used harness, as well as delph and crockery. One of them in particular stands out in my memory, as a great salesman. I remember his sales-talk well; he could hold the crowd enthralled as he strained a halter to prove its worth, or extolled the `makings' of the cotton shirts he was "giving away for nothing". I tell you they will wear like a woman's tongue", he used to say. The train brought Dr. Sequa to the Market, and he too, made for the Market House area. In those days, everybody had his own molars and their attendant pains, and the Doctor specialised in toothache powder. "It doesn't cost a pound or one-twentieth of a pound—pay a penny for this lightning cure". It was bought; sometimes the psychological effect was marvellous, but even in those days, the wiser ones knew that it was only yellow ashes. Close by him stood the Black Doctor (Mohamed- Barber) drawing teeth, and drawing them usually with his finger and thumb. In Bridge Street, the cabbage plants were sold by the long hundred, and up towards the top of the hill of High Street, known as the Mount, bundles of rods for thatching, were sold. At that time, too, the bonhams [young pigs in Irish] came across the lake from Tourmakeady and the hill country. They were sold in New Street; and Cornmarket, of course, got its name because of the wheat, barley, oats and rye which were always sold there. There were many other interesting things about the market that I have not mentioned and many things I am sure that I have forgotten. There were many other characters too; Margaret Bowman, Jack Burke the pig-sticker with his ginger beard, the gold-watch man; they are all gone now, and old Ballinrobe with them. We have made great progress in our living conditions; our schools nowadays are better, and people have greater opportunity. But often, in thought, I go up and down the streets of my dear old town and my youth comes back to me. * A 'skib' was a traditional round flattish Irish basket used to strain and then serve potatoes. The skib was placed in a central position, around which a peasant family gathered to eat their main meal of the day; potatoes. The skib usually hung on a cottage wall when not in use. Scanned with the assistance of R.R.S. scheme Ballinrobe. This page was added by Averil Staunton on 23/05/2013.